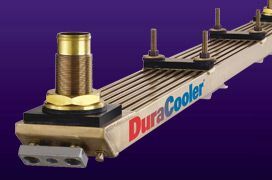 Designed for superior performance in the most demanding environments. Johnson Cutless. The bearing of choice for gritty, abrasive working environments. Recreational boaters depend on Johnson Cutless to protect their investment. The Water Wedge Principle minimizes bearing and journal wear. The elastic characteristic of the rubber polymer allows the landing surface to deform and create a natural pocket allowing a hydrodynamic lubricating film to completely separate the bearing surface and the shaft. At this stage the coefficient of friction is well under 0.001, reducing “system wear” to a negligible amount. A seal is created at the leading and trailing ends and bearing “land” areas causing hydrodynamic grit rejection. 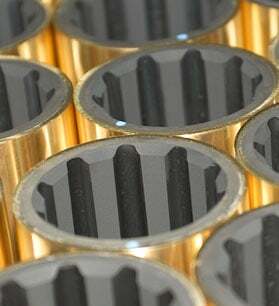 Abrasive grit is flushed out through alternating grooves, protecting the shaft from damage. The tribology forces of rubber, when lubricated with water makes it one the most slippery materials. 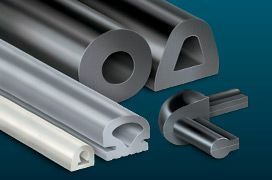 When sliding on a wet metal surface friction can be virtually eliminated, making it the perfect material to use for water-lubricated bearings. The elastic properties of rubber allows grit and dirt to press into its surface until they are flushed out, protecting the shaft from scoring - unlike hard surface materials that can cause excessive shaft wear. Rubber is able to utilize any lubricants with low viscosity, such as water. When starved of water, rubber will not wipe or fail in a sudden catastrophic manner like hard surface materials. Rubber can crystallize but will always maintain its form. Each rubber landing area acts as an independent bearing surface. Rubber bearings always have contact area due to the elastomeric properties. Water-lubricated rubber has twice the specific heat of oil. An equal weight of water will absorb twice the heat of oil lubricants. Rubber Water-Lubricated Bearings, The Environmental Solution. Water lubricated rubber bearings offer an alternative solution to the ever growing concerns of environmental restrictions, the high costs of maintenance and the replacement in today’s marine industry. How are rubber-lined bearings an alternative? They use water as the lubricant. 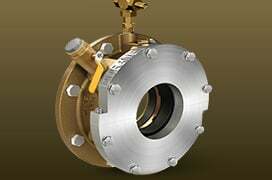 This concept is very important because if water is used rather than oil, contamination seals are not required. If seals are not required, pumps and tanks may not be necessary. This leads to a simpler shaft bearing system and immediate cost savings. Advantages of Rubber Properties In Water-Lubricated Bearing Design. The proprietary rubber formulation of the lined bearing is broken up by water grooves into a number of lands or faces. These surface lands run parallel to the shaft and serve in supporting it. A tough resilient rubber compound is selected which is relatively immune to the action of grit and sand and also helps reduce noise and vibration. 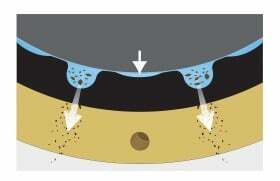 When a grit is trapped between the shaft and the rubber, it is depressed into the landing’s elastic surface and rolled into an adjacent water groove where it is immediately flushed out of the bearing. With proper loading, rotational speed and clearances, a water wedge is formed in the rubber landing causing the shaft to ride on a thin film that totally separates the shaft and bearing surface. This is known as hydrodynamic lubrication. At this juncture both friction and wear decrease significantly in a rubber bearing. Our proprietary rubber formulations have nothing more to prove. Rubber bearings are on more vessels around the world than any other material. 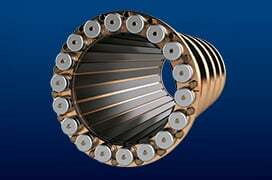 Our Johnson Cutless Bearings have set unbelievable performance records that other bearing materials are still trying to meet. Johnson® is a registered trademark of Duramax Marine® LLC. 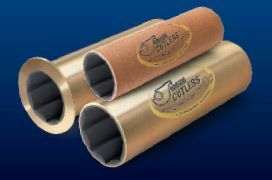 Cutless®is a registered trademark of Duramax Marine® LLC.